One of the greatest dangers awaiting mature Americans traveling abroad does not stem from political unrest, but rather from the possibility of a medical emergency occurring in a foreign land. Relatively few older Americans realize that Medicare coverage will not follow them once they leave the United States. In addition, because there are few exceptions to the Medicare foreign exclusion, many older travelers have no choice but to purchase Medicare supplemental policies or risk sizable out-of-pocket expenses in the event of a medical emergency while abroad. Mr. Whitman’s note first introduces the Medicare program, discussing its history and operation, and the puzzling lack of attention given to the Medicare foreign exclusion by scholars and legislators alike. 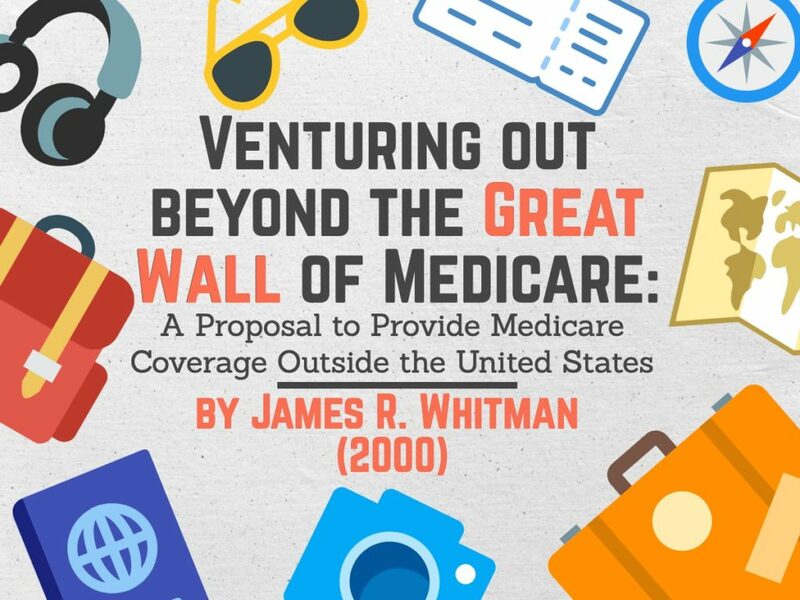 Problems like the U.S. government’s inability to monitor and ensure the quality of foreign medical care and the desire to spend Medicare dollars in America, Mr. Whitman argues, have led to the erection of a “great wall” around the United States, beyond which Medicare coverage does not extend, except in limited circumstances. In contrast, Mr. Whitman observes, other governmental programs like Social Security, Supplemental Security Income, and TRICARE, which provides medical coverage to military personnel and their dependents, have no analogous foreign exclusion. To resolve this anomaly and suggests amending the Medicare foreign exclusion in two ways: first, to expand ordinary Medicare coverage for services received outside the United States from any American-owned health care provider and, second, to include benefits for medically necessary emergency services received from any foreign provider while the beneficiary is outside the United States for a limited time. James Whitman is a member of the University of Illinois College of Law class of 2000 and of The Elder Law Journal, serving as an Articles Editor during the 1999–2000 academic year. Previous post: Medicaid and the Middle Class: Should the Government Pay for Everyone’s Long-Term Health Care?